Who cannot fall in love with this face and those ears???? Frenchy comes with a breed back to either of our Black Champions, Brookhollow's Midnight Express or Double 8 Domin8tor, or our TOP 5% EPDs AOA Enterprising Encore.!! We are stacking the deck in your favor by pairing Futurity Reserve Dark Herdsire of the Year genetics of Dark Shaddow with your choice of one of our Champion Herdsires! Look at that Face! A Face To Fall In Love With...French Kiss, sired by champion son of Dark Shaddow, Grand River Belvedere, is a solid true black female. Her fleece is fine (22mc adult sample) and long (5 inch staple). She has a uniform crimp style across her blanket. 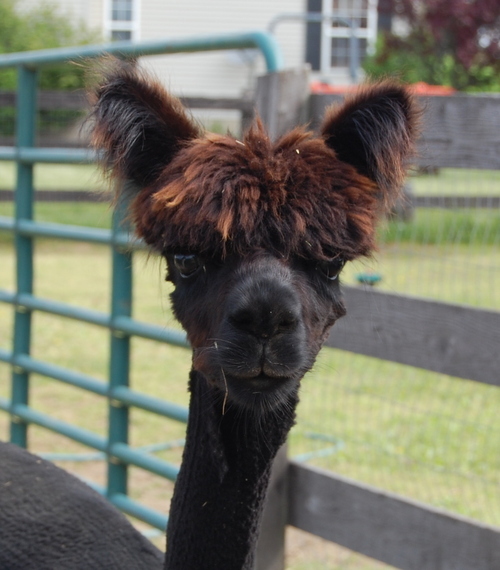 Certified Fleece Evaluation: French Kiss is maintaining a consistently fine fleece (lingering fineness) as she ages. Her fleece received an excellent evaluation by certified sort. Her fleece is consistent in micron across her blanket with her secondary’s being rated as a 2 (superfine = 20-22.9 microns) and her primaries rated as a 3 (fine = 23-25.9 microns). Brightness 7/10. She continues to produce lovely fiber that is processed into exquisite yarns!! At age 13 she still produces an abundance of fine fleece!! 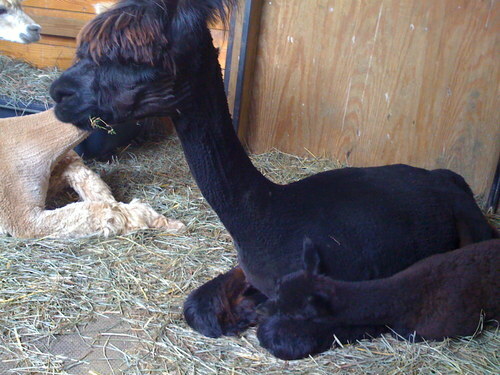 Maternal Instincts: Frenchy is an exceptional mother with plenty of milk and love for her cria. 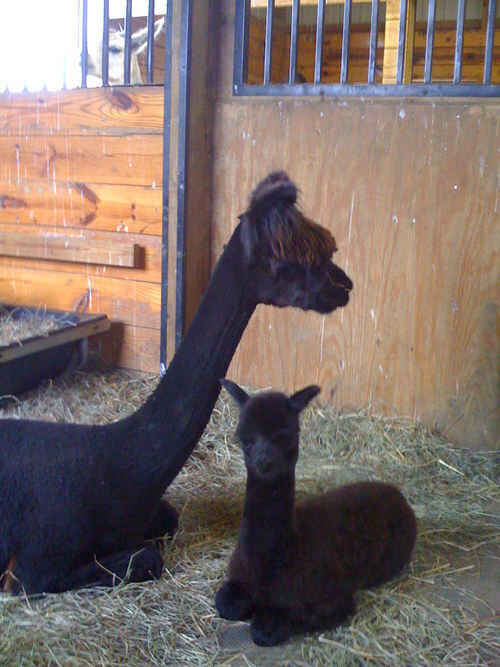 She has produced a beautiful black male, Double 8 Black Jacque who stands stud at a farm in VA, Double 8 Paris –a ribbon winning dark fawn female and now Kissed@Midnight is the black female at her side. 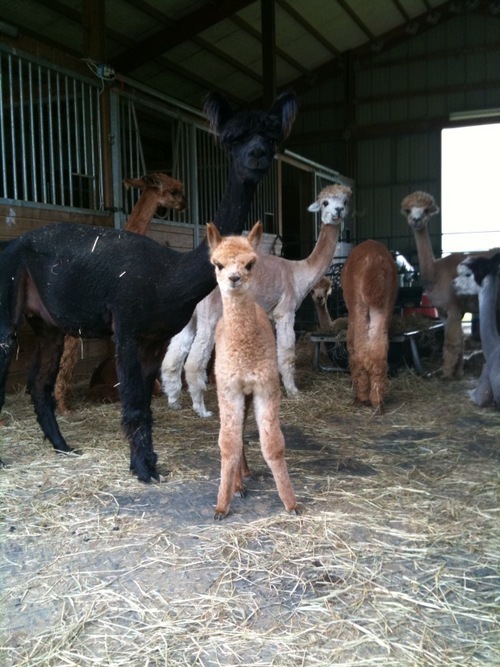 The IgG for all cria have been greater than 2,000. They all have very fine and extremely bright fleece! Frenchy has a very even temperament. She is super sweet and she gets along well with her herd. In addition to all of the previously mentioned attributes, our favorite is still her extremely fleecy ears and muzzle. 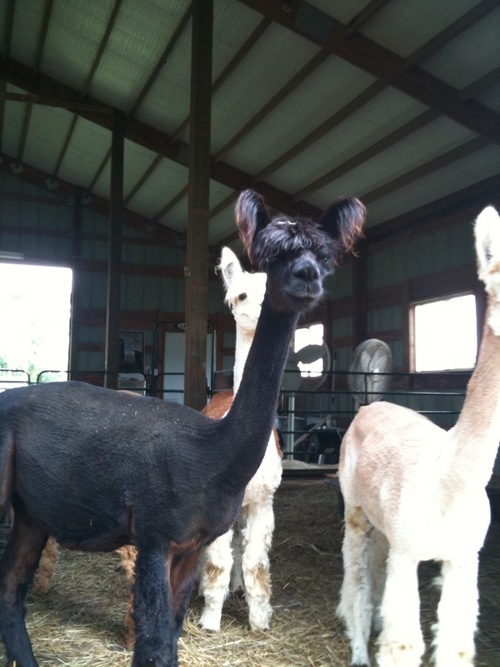 They make her one of the cutest alpacas on the farm! Add an excellent Black production girl to your herd! You will fall in love with her, just as we have! Call us today to discuss the possibility of adding an excellent Black production girl to your herd! You will fall in love with Frenchie and her cute self, just as we have! This one will be hard to let go of, so don't wait long! !